Wisconsin-based Web hosting provider MonsterMegs (www.monstermegs.com) announced today, that it upgraded all their web servers to utilize pure ssd hard drives. “Since our upgrade to pure ssd storage, we have noticed a load drop of about 60% across all servers.” said Kevin Kopp, MonsterMegs Owner “Not only have we seen the load drop on the servers, but client websites are now loading up to 300% faster than they did on previous standard SATA drives.”. SSDs have lower access time, less latency and IOPS up to 100x more than normal drives. 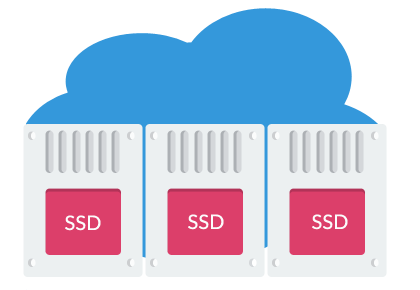 This leads to maximum performance with page load times up to 300% faster on our SSD platform compared to standard hard drives. Put in a Raid-10 array, multiple ssd drives outperform a single drive setup and ensures maximum reliability. According to Kevin, several key factors play a role in offering a high performance hosting environment: “Top-of-the-line hardware, undersold servers, and heavily-optimized processes are all things that MonsterMegs Hosting Service clients have become accustomed to. With the introduction of SSD hard drives, our web hosting services have never been faster and more reliable.”. All MonsterMegs hosting plans include features such as cPanel, Litespeed Web Server, Cloudlinux, and Mariadb database services. Also included with every MonsterMegs hosting plan are many advanced features such as Softaculous (1 Click Script Installer), real time virus/malware scanning, and Cloudflare CDN. MonsterMegs is based outside of Milwaukee, Wisconsin with their hosting servers located within various datacenters including PhoenixNAP (USA) and EvoSwitch (Netherlands). Their services include SSD Web Hosting, SSD Reseller Hosting, and SSD Powered Semi-Dedicated Enterprise Hosting Solutions. MonsterMegs has been providing web hosting solutions since 2010. Previous PostPrevious MonsterMegs Now Offering CloudFlare Railgun.